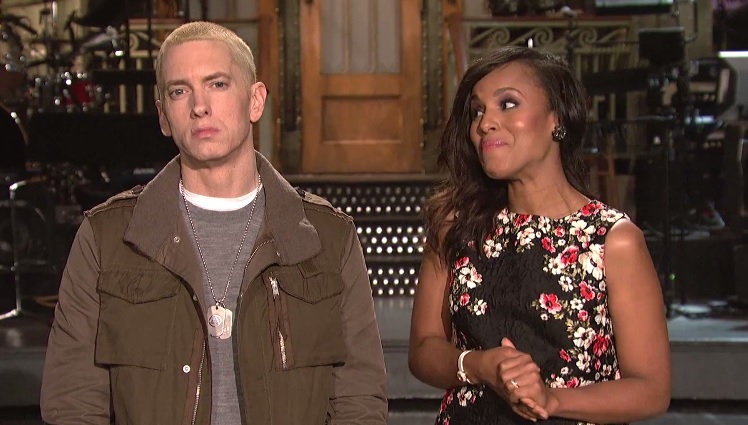 Here’s a short new promo clip courtesy of NBC which features Eminem and Kerry Washington. Eminem will serve as the sketch comedy shows musical guest this Saturday while Washington will do the honors of hosting the latest episode. Watch as Marshall decides to keep a straight face, refrain from really moving at all and does little to engage the camera. Meanwhile, Washington showcases her bubbly and outgoing attitude as she playfully announces plans for her and Eminem to grab some cupcakes following the show’s taping. This entry was posted in Miscallenous, Video and tagged comedy, eminem, kerry washington, NBC, saturday night live, sketch comedy, the marshall mathers LP 2, TV. Bookmark the permalink.